Can I build in a field to calculate a value? I am building an order form for our website, and want to build in a field that can calculate the shipping cost based on the amount of the order. Is that available on JotForm? I need to calculate the value depending on some variables. What kind of calculation will you be doing? Can you provide more details on the questions and calculations you will make? I'm also kinda interested. I'm looking for a spot where people can enter quantities for several things and it'll tally up their order. Sort of a single page order form idea. That's me at least. Right now people submit what they're after, and I reply to them on the prices, which is fine, but could use a little more automation. As it is set up now, the payment tool calculates the order total, but we need to add in a variable shipping cost to that total based on the quantity of items selected. Our shipping is based on a weight range, and our products are uniform weights (1/2 lb, 1/4 lb, 1 lb, etc.). For example, and order that totals 4 lbs would fall into the shipping charges for 3-5 lbs and that charge, say $20, would be added to the total. If you will only find total for the products and quantities, the "Purchase Order" option will do what you want. It is under "Payment Tools". You can add multiple products, enable "Quantity" options for then and then enable "Show Total" feature. I am currently using the Purchase Order option, but it can only calculate the total based on selected quantities. What I need is to be able to perform a calculation (or run a formula/macro like in a spreadsheet) to add in a variable cost based on the quantities selected and then add that value into the order total. I really need something similar. When a client selct to purchase a product he should be supplied a alternative to add different options with prices to each product to be calulated into the total. So to sell multipple products to one client it would be a big progress if it could be possible to add prices in the Add New option form. And the seller should have the opportunity to chose to use either the radio button or the checkbox to avoid the customer make choices that might exclude each other other. A car can be sold for a Standard Price, with the option to include engine a,b or c to different prices. 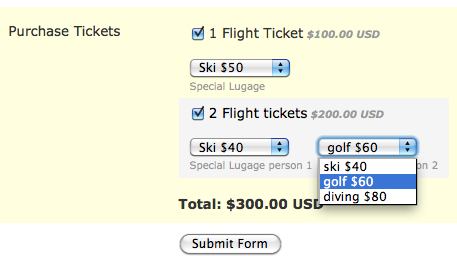 Yes, you should be able to do this if you select "Users can select multiple products". I am not sure what I am missing. Don't you already have the ability let users choose multiple options for the event using "Users can select multiple products"? Ok, I now see what you mean. You would like to be able to change the price of total using "Options". I'm not sure how we can implement this but I added this to our feature requests list. Thank's I really appreciate your promt answer and great support! I belive you will find a soultion... guess you can figure out different methods to do the same...It don't matter so much how you do it is as long as it is a opprtunity you supply. togheter with the rest of the very good solutions you have... good layout, conditions, autorespond, unique id, password etc... I think the ability to change the price of total as described above would make the purcahse tool really flexible and make Jotform really good for commercial use.. Thanks for your nice words. We work very hard to make JotForm work well for commercial use.